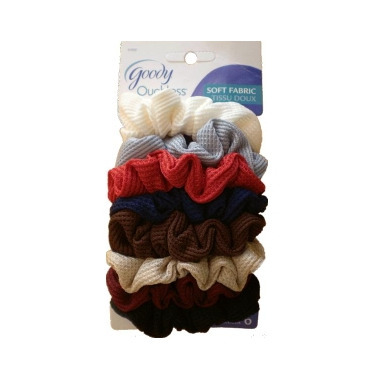 Goody Ouchless Scrunchies are the perfect way to put your hair in an up-do, in a fashionable and easy way. These soft fabric scrunchies are made with plastic and cotton and are suitable for all hair types. I LOVE these scrunchies. They are gentle on my hair and hold it in place. Would love to see more colours. So happy to have scunchies again! They work well and don't get caught in my curly hair like regular elastics do. I've used these scrunchies in the past and the are still the best for holding my fine hair. I wish they had other brighter colors for spring. I ordered these Hair Scrunchies thinking they were going to be thick like they look in the picture but then are thinner then what I was expecting. They look nice buy I like the more puffy one's. Amazing! Love these scrunchies. They have the right hold to them and you can color coordinate them with your outfits on a daily basis! Would highly recommend! What to say about this product, holds my hair in place just fine. Great quality and it doesn't pull on my hair. Have another pack in my cart.